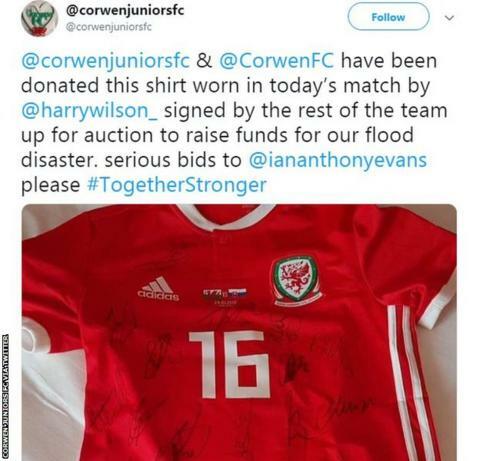 Harry Wilson has donated the shirt he wore as Wales beat Slovakia for fund-raising efforts to help his former club raise money to repair flood damage. Liverpool's Wilson is on loan at Derby County for the 2018-19 season. Meanwhile since the flood, Corwen Juniors have seen boys and girls teams play home games elsewhere, including their local leisure centre and at Ruthin. Corwen FC, who are top of the Welsh National League Premier Division, are also involved in the fundraising efforts.